Tae Joon Lee gave a talk on "An Analytical Framework of Technological Innovation System: the case of nuclear power system". 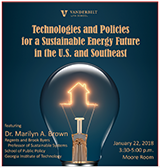 January 22, 2018 – Dr. Marilyn Brown gave a seminar at Vanderbilt University on "Technologies and Policies for a Sustainable Energy Future in the U.S. and the Southeast." 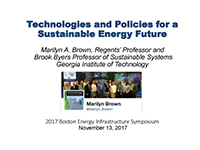 "Technologies and Policies for a Sustainable Energy Future" presented at the North American Energy Infrastructure Symposium, November 13, 2017, Boston. Matt Cox shows how a 50% clean energy effort could reduce home electricity bills in Atlanta by 54% in 2035. Perfect backdrop for this message at the Episcopal Church of St. Philip. Dr. Brown gave a presentation at the Chattahoochee Riverkeeper Climate Change Conference in Atlanta, GA on September 26th. Her presentation was titled "Saving Water by Transforming our Electric System"
Please click on the image to the right to view the presentation! The SPARK 2017 Conference - Igniting Energy Innovation was held in Atlanta, GA on September 14, 2017! Dr. Brown was one of the presenters, giving a talk titled "Movers and Shakers in the U.S. Power System - Distributed Resources." Please click the link above, or the image to the left to view Dr. Brown's presentation! Dr. Brown presented at the Annual Georgia Environmental Conference in Jekyll Island, Georgia August 23 - 25, 2017. View her presentation on the Georgia Climate Project here. D r. Marilyn Brown gave a presentation on February 20, 2017 at the Georgia Tech Scheller School of Business titled, "Selling Energy Efficiency in a Carbon-Conscious World" as part of the Carbon Conscious series. Dr. Marilyn Brown gave a presentation as part of the "Great Decision Series" on February 9th titled "Geopolitics of Energy and Climate Change". James Haverty Smith (Perkins+Will) and Harry Findlay (retired, Emory University) were the series organizers, and the venue was the Dunwoody United Methodist Church in the northern Atlanta suburbs. Usayd Casewit recently participated in a South GA solar energy industry study trip. You can watch the panel discussion discuss the role of fossil fuels and renewables, energy efficiency and prosumers, digitalization and data analytics, energy poverty and much more. Marilyn Brown gave a presentation at the 8th Annual Southeast Solar Summit in Atlanta, Georgia on October 20th 2016. Marilyn Brown gave a talk at the National Academies on July 12, 2016, outlining "energy and climate" ideas for the research agenda of the newly re-constituted Geographical Sciences Committee. Huibin Du gave a presentation on "Might the large-scale PV power generation be reached in China? 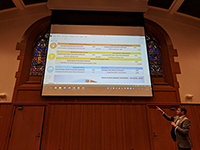 A grid parity combined with techno-economic analysis" at 2016 Chinese Environmental Scholar Forum held in Princeton University on Saturday, Jun 4, 2016. Coauthors are Marilyn Brown and Hongyang Zou. Marilyn Brown and Frank Southworth gave presentation on the future of electric vehicles at the "Research Workshop on the Psychological and Policy Dimensions of Transport," sponsored by Aarhus University, in Copenhagen, Denmark, on Friday, February 19, 2016. PhD Student Mallory Flowers gave a conference presentation of her paper "How (and Why?) Do firms Certify Green? The Case of LEED" at the 2015 Fall Research Conference of the Association of Public Policy Analysis and Management (APPAM) on November 12, 2015. The paper is co-authored with Dr. Doug Noonan from the School of Public and Environmental Affairs at Purdue, and CEPL's own Dr. Dan Matisoff. "Energy Efficiency & Solar: The Leading Customer-Based Resources". Dr. Brown presented this PowerPoint at the TenneSEIA Annual Meeting on Monday, November 9th in Nashville, TN. Dr. Brown gave a presentation to the National Academies on Environmental Change and Society titled "Reducing GHG Emissions in Federal Agencies: Insights from social science on organizational change"
2015 EPA Region 4 Community Workshop on Energy Efficiency. 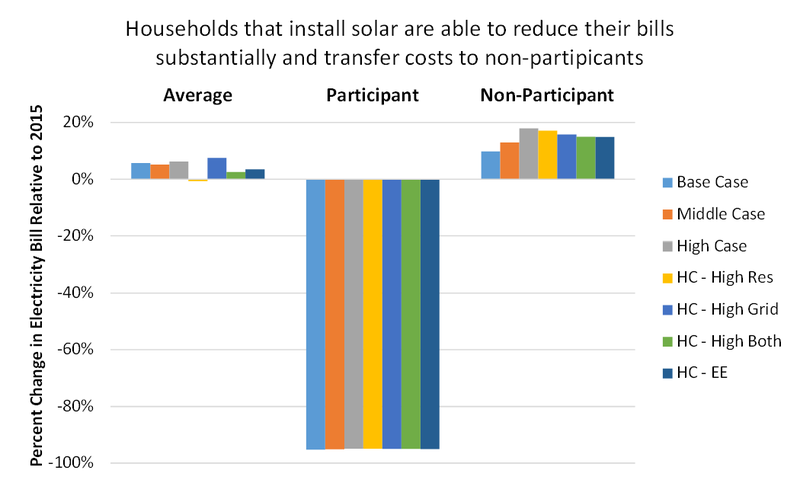 Titled: "Green Savings: How Policies and Markets Drive Energy Efficiency." Dr. Marilyn Brown gave a talk on Friday, April 24, 2015 at the inaugural Day of Scholarship event at Emory University titled: "The Future of Climate Change"
Dr. Marilyn Brown gave a presentation on February 12, 2015 at the National Research Council's Committee on Pathways to Urban Sustainability, on "Maximizing Trade-Offs Among Social, Environmental, and Economic Benefits"
On December 5, 2014, Marilyn Brown gave a presentation at DOE's Cornerstone Workshop for the Quadrennial Technology review, on "Analytic Approaches for Assessing RD3 Needs across the Energy Sector"
Dr. Marilyn Brown gave a presentation "Integrating Energy Efficiency Into the DG Mix" at the Agile Utility as part of the Georgia Tech Energy Series on November 12, 2014. 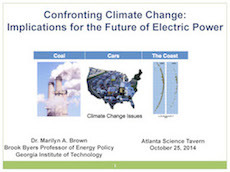 On October 25, 2014 Dr. Marilyn Brown gave a talk to a crowd of 100+ at Manuel's Tavern in Atlanta on: "Confronting Climate Change: Implications for the Future of Electric Power." Our region, along with the rest of the nation, faces a number of challenges in making the transition to ways of producing electrical power that are consistent with meeting CO2 restrictions inposed by climate change goals. Please visit the Atlanta Science Tavern website for more details about the event, including a podcast that will be posted shortly. 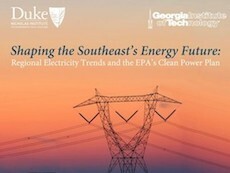 Georgia Tech and Duke are collaborating to host a workshop which will gather stakeholders from diverse viewpoints to explore the Southeast’s transitioning electricity sector and the U.S. Environmental Protection Agency’s proposed Clean Power Plan to limit carbon dioxide emissions from existing power plants. Topics covered will include the regional nature of the electricity system; current trends in the Southeast’s electricity sector; key issues raised by the EPA’s proposal; state flexibility in compliance planning; and tradeoffs between individual- and multi-state approaches to managing carbon dioxide emissions. PhD student Alexander Smith, gave a presentation on "Policy Considerations for Adapting Power Systems to Climate Change" at the Energy Policy Research Conference in San Francisco on September 4, 2014. Dr. Marilyn Brown and Dr. Dan Matisoff spoke at the "Southeast 111d Technical Summit" hosted by the Southface Energy Institute on August 13-14, 2014. On June 29, 2014, Dr. Marilyn Brown testified and participated in a press conference at the EPA hearing on EPA's Proposed Clean Power Plan for existing Power Plants in Atlanta, GA. A transcript of her testimony is available.